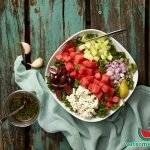 This Grilled Watermelon & Kale Salad will wow your taste buds. The sweet and smoky grilled watermelon is a great balance to the nutrient-dense and somewhat bitter dinosaur kale. Preheat your grill to high. 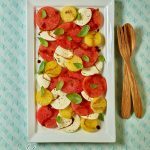 Brush the watermelon with olive oil and season with salt and pepper on both sides. Grill each side for 2 to 3 minutes, or until you have nice grill marks. Transfer the watermelon to a large plate and set aside. Remove the stems from the dinosaur kale and cut the kale into thin strips (julienne). Massage the kale gently which helps to make it less bitter. Place in a large bowl and add the baby kale. Top with the crumbled goat cheese and the slivered almonds. Whisk the olive oil, balsamic vinegar, garlic and honey together in a liquid measuring cup until well combined. Season with salt and pepper, to taste. Drizzle over the salad and toss to coat. Serve the kale salad with a wedge or two of the watermelon. *If you can’t find dinosaur kale, substitute with another kale of your liking. 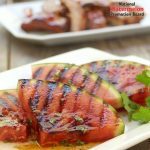 This recipe was kindly provided by our featured member, National Watermelon Promotion Board!